This weekend, a small man in his seventies will lace up his running shoes and head out the door of his home in north-west England to complete a daily ritual that began on December 21, 1964. For the past half a century, Ron Hill has run at least a mile every day without fail. It is a remarkable streak and a larger-than-usual number of parkrunners in Manchester are expected to join him on Saturday to celebrate the milestone. In total, the daily efforts have seen him run the equivalent of more than half a dozen times around the planet – or halfway to the moon. Hill is no ordinary mileage-crunching plodder, though. 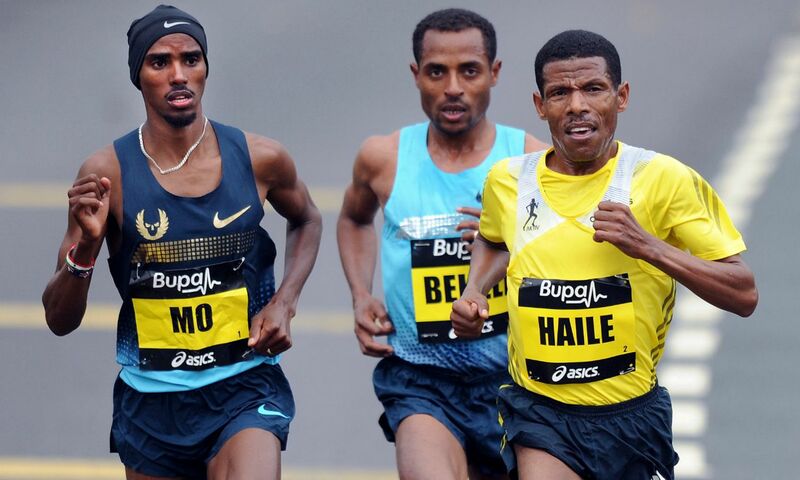 In his heyday, he won the Boston, European and Commonwealth marathon titles – the latter with a gun-to-tape 2:09:28 that only one Briton, Mo Farah, has managed to beat this year. Marathons aside, Hill won the English National cross country title twice during an era when it was one of the most prestigious races on earth. 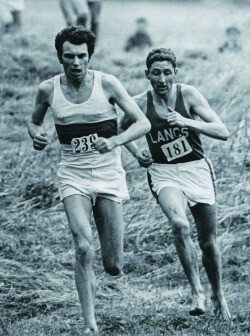 He won the UK Inter-Counties barefoot in the middle of the British winter (pictured, No.181, alongside Mike Tagg). He broke world and British records on the track. Even as a veteran runner he clocked 2:15:46 for the marathon – a mark that survived as the British masters best until this year, when Steve Way beat it in the Commonwealth Games. What’s more, Hill was ahead of his time when it came to marathon preparation. He helped popularise the use of the pre-marathon carbo-loading diet and, using his PhD in textile chemistry, he raced in breathable, mesh vests – which at the time were unheard of – to keep cool and he later created the Ronhill and Hilly clothing businesses, both of which are still going strong today. When Hill began his unbroken streak of consecutive daily runs, Beatlemania was all the rage, the British Parliament were still discussing whether to abolish the death penalty and Hollywood movie premieres included Mary Poppins and Goldfinger. In athletics, it was also the era of cinder tracks, Peter Snell and Abebe Bikila, while the Fosbury Flop had not yet been invented. Indeed, Hill told Athletics Weekly this month that life was very different back then. “I used to find back streets to run down for my training runs,” he recalls, “because runners were considered an oddity. Although he adds that he does wear a GPS watch today and has discovered, to his mild horror, some of his old running routes are not as far as he thought. So to partly make amends he weaves into his current training what he calls “payback miles”. In keeping with his old-fashioned principles, Hill has used a similar ‘no frills’ A4-size notebook to log his training sessions and races. It doesn’t even have dates written in it. “I just draw a margin down the side with a ruler,” says Hill, describing what must be among the most valuable and fascinating set of running diaries in existence. Hill’s longevity matches that of his great hero, Alf Tupper, the comic strip character that inspired him to get involved in the sport. As a teenager, Hill was no great talent and finished only 174th in the youths’ race at the English National in 1955, but like Tupper he saw himself as the working-class, northern underdog with a determination one day to “run ’em all”. Such was his desire to get the most out of his potential, he once experimented with 150-160 miles per week. Of course, he has endured his fair share of injuries as well but has an interesting theory to combat them. Instead of resting, he believes gentle running promotes circulation, aids the healing process and stops the body from jamming up. I met Hill four years ago at the Great Manchester Run to do a feature on him in AW and I was struck by how he walked through packed crowds near the finish line of the Great Manchester Run almost unnoticed as thousands of modern-day fun runners brushed past him, oblivious to his great achievements. If one of today’s stars like Mo Farah or Haile Gebrselassie had done the same, they would have been mobbed by autograph-hunters and selfie-snappers. Earlier this winter, it was good to see him inducted into the England Athletics hall of fame. Generally, though, this phenomenal running machine deserves more kudos than he receives. He is one of the sport’s genuinely legendary characters. His marathon performances from more than 40 years ago have stood the test of time, while his training diary exploits are held in awe by anyone who has tried to keep a log of their own.